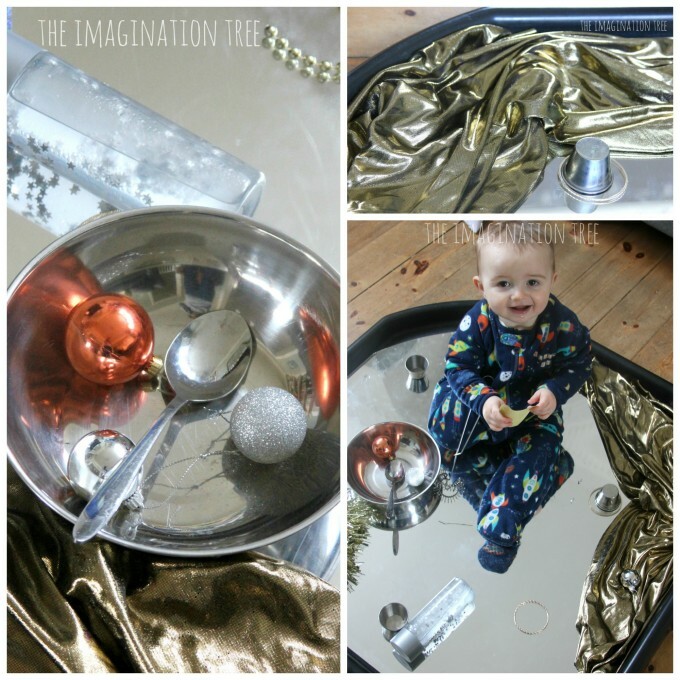 Make a baby and toddler sensory play tray and fill it with materials and objects to discover about reflections! 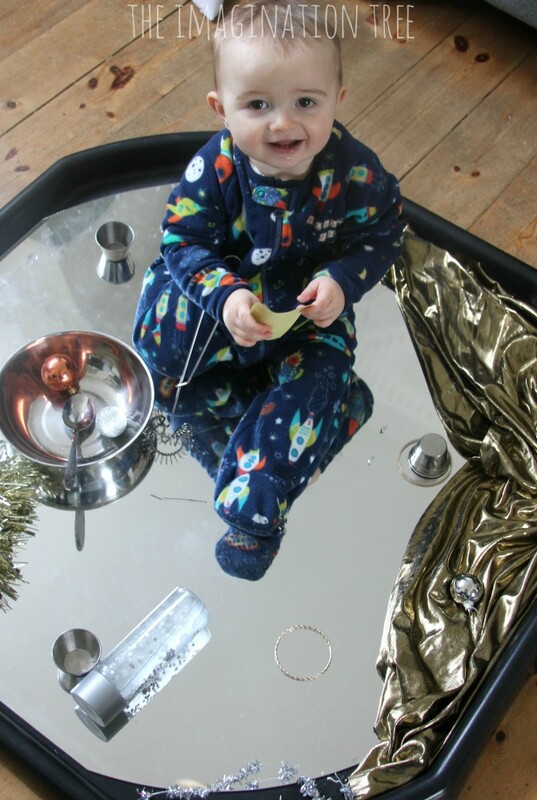 Heuristic play taken to the next level from treasure baskets to full body exploration! 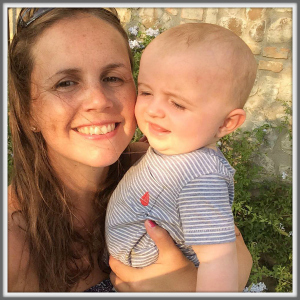 If you’ve been reading this blog for a long time you will know that we often write about baby and toddler play, with heuristic, natural exploration of the world being a big theme. 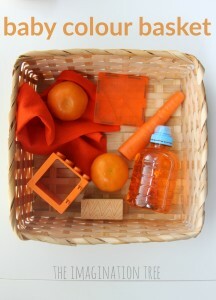 In our original post about baby treasure baskets there are many pointers about the thinking behind this type of play, as well as some examples of what items to add to your baskets to get started. Baby boy has also loved his recent treasure baskets and big sisters have come back to play with them again. I’ve got a new post to share here soon about his recent play with them. We have been really enjoying having our own Tuff Spot (builder’s cement mixing tray) and are finding lots of ways to use it both inside and out. These are so fabulous for sensory play as they have a lip around the edge, containing most of the mess. They are also fantastic for full body sensory play trays as little ones can simply sit inside them, exploring the tactile materials and being completely absorbed by their play. We have a set of legs (height adjustable stand) for the tray too, which can be adjusted to three different height levels, which I will show you in an upcoming post. Needless to say, I wish I’d invested in one of these years ago! I always had them in my classroom but they’re so perfect for home learning and play too. It even makes a brilliant place for playing with Lego for older kids! All of these are fairly readily available and make a lovely variety of sizes, textures and shapes to feel and look at. When placed together they are irresistible to touch, shake and mouth. The beads fit well inside the containers and make a great noise too. The material is almost fluid to touch and wraps well around the other objects. 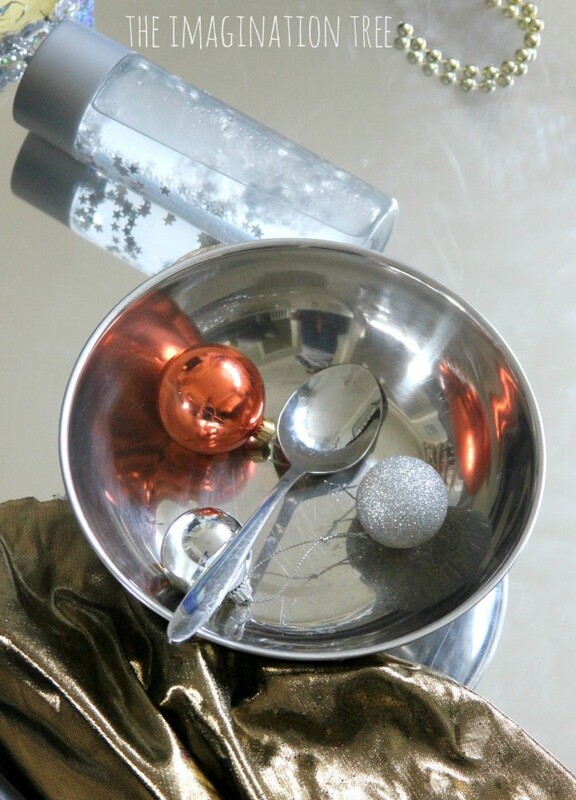 The tinsel is just fabulous and provides a great contrast in texture to the harder metallic objects. The spoons and whisks just begged to be banged against the metal bowls and this provided a large part of the activity, contrasting the swishing noises with the loud tapping! The balls were lots of fun to roll around on the surface and put in and out of other objects. Perhaps best of all was the mirrored base, as of course, everything he did he could see himself doing. He often stopped and stared at his own reflection and was mesmerised by the way he could see the objects twice. His 3 year old sister also loved playing in here with him and by herself, showing again that sensory play and tactile explorations are so important for older children as well as little ones. Even his 7 and 5 year old sisters got involved and loved assisting his play too. 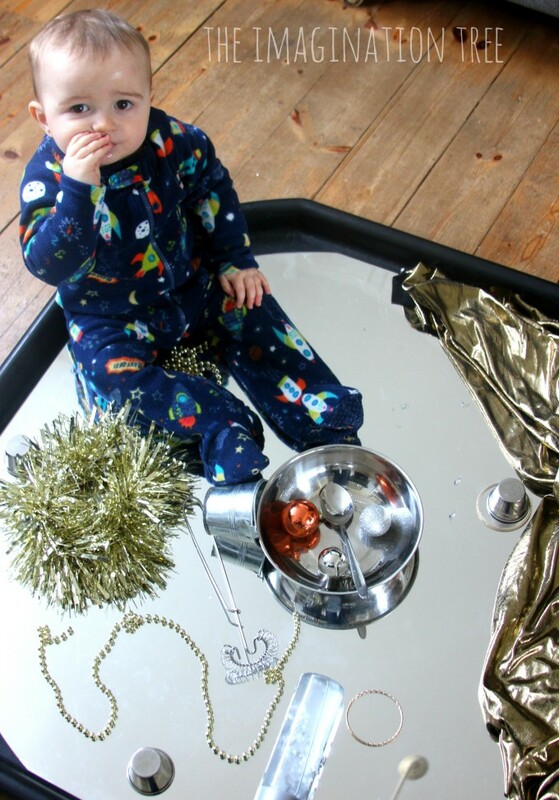 The open, wide nature of this play tray makes it a fabulous invitation for babies and toddlers who are sitting and crawling as they can get involved and choose to come and go. We have already been playing with this in a myriad of other, simple and engaging ways with everyday toys and materials, as well as some messy and arty play activities too. 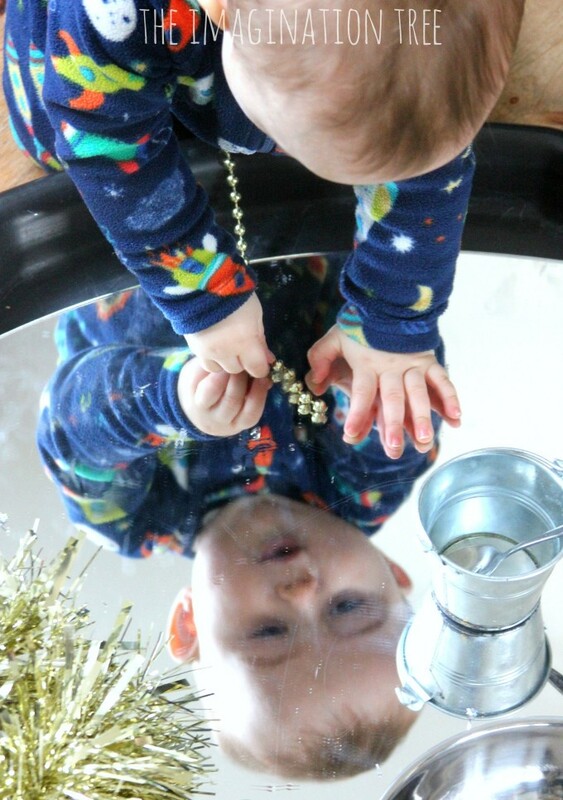 I look forward to sharing those with you in our new Baby and Toddler Sensory Play series! 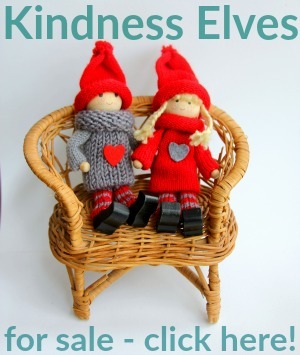 To see MANY more fun and easy ideas for playing with your baby or toddler, LOOK HERE. To follow my BABY PLAY board on Pinterest follow here. 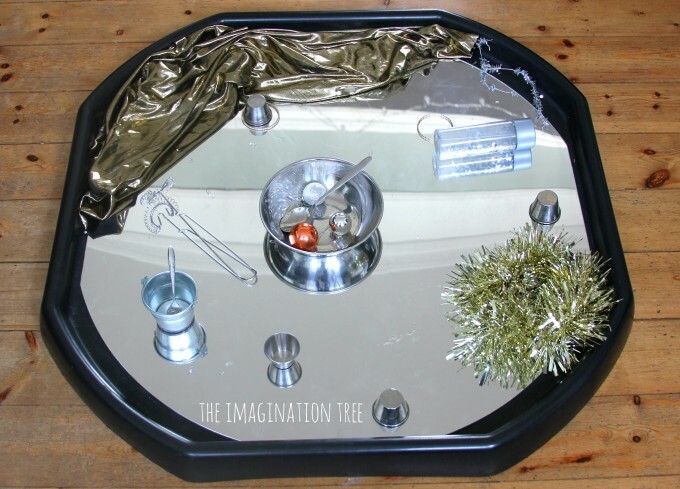 Follow Anna @ The Imagination Tree’s board Baby Play: 0-18 Months on Pinterest.